This Sunday marks the two hundredth anniversary of Constitution’s most famous battle. On August 19, 1812, the ship met and defeated the British frigate Guerriere. It was a decisive victory, as sensational then as it is interesting today. 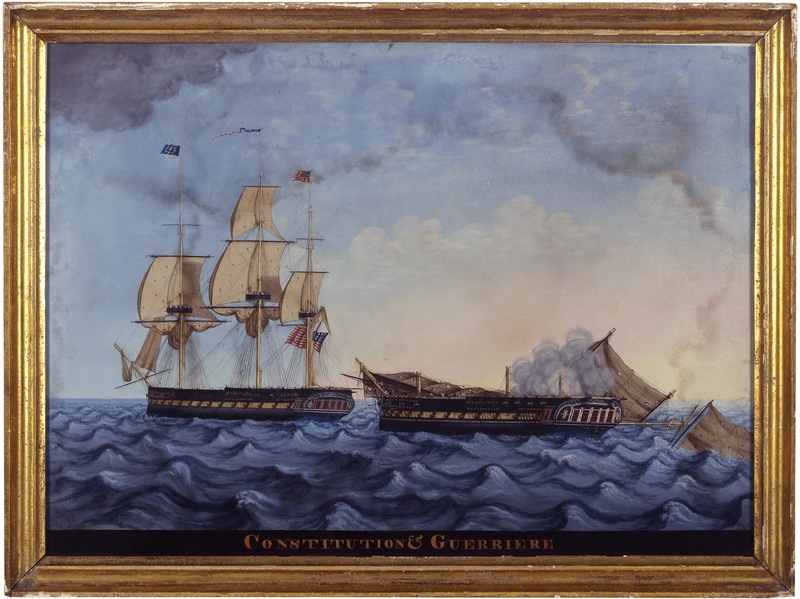 It was not the first American naval victory of the war (that honor went to USS Essex’s crew, who captured HMS Alert on August 13), but it won ever-lasting laurels for the victors and established Constitution (newly christened “Old Ironsides”) as a household name. 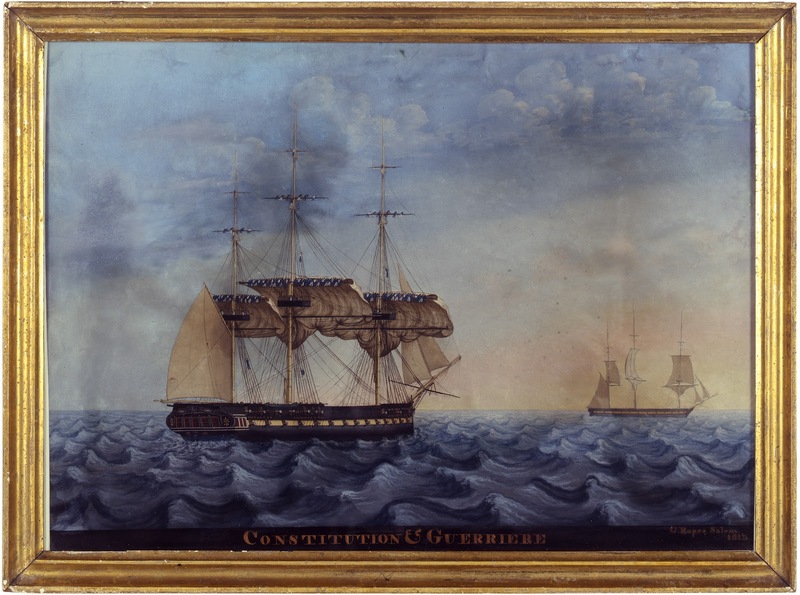 Constitution sailed from Boston on August 2, 1812 and steered for the blustery waters southeast of Halifax, Nova Scotia. Over the next two weeks, as Captain Isaac Hull drilled his crew at the guns, Constitution captured four British merchant vessels. A real prize – a British frigate – continued to elude them. Then, on the afternoon of August 19, the sought-after ship appeared. “Took in our Top Gallant Sails, Staysails, flying Jib, hauled the Courses up, took 2d Reef in the Topsails.” The first in a series of paintings of the battle between Constitution and Guerriere by George Ropes, Jr., 1813. USS Constitution Museum Collection. “[A]t 15 minutes after 6 PM the Enemy’s Mizen Mast fell over on the Starboard Side, on which our Crew gave three cheers.” The second in a series of paintings of the battle between Constitution and Guerriere by George Ropes, Jr., 1813. USS Constitution Museum Collection. 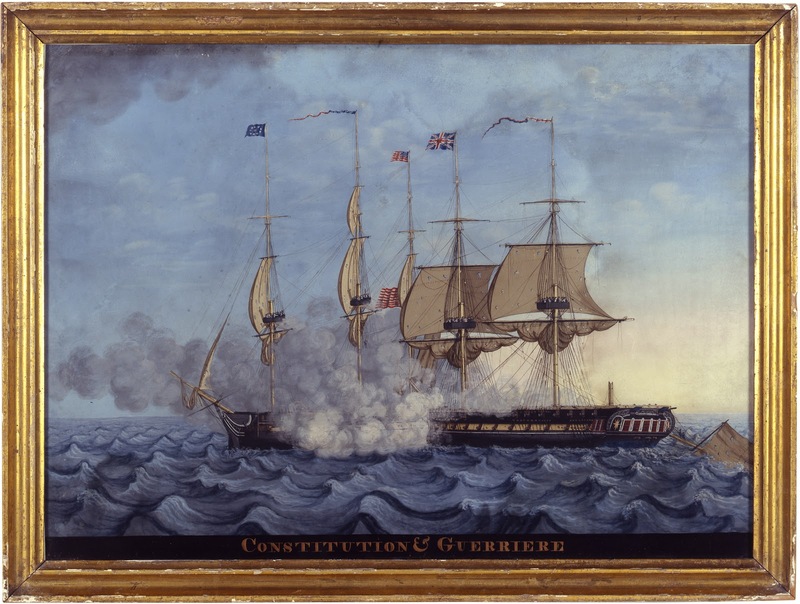 “[H]is Fore, and Main Masts fell over on the Starboard side.” The third in a series of paintings of the battle between Constitution and Guerriere by George Ropes, Jr., 1813. USS Constitution Museum Collection. So ended an eventful day. Constitution’s surgeon, Dr. Amos Evans, recorded the damage done to his ship and the enemy. “Our crew behaved very nobly. They fought like heroes, and gave three cheers when the colours were hoisted. They also cheered when each of her [Guerriere’s] masts went over the side, and when her colours were struck. Whilst she was on our stern one of her forward guns was run nearly into our Cabin window and fired, but did (fortunately) little or no execution. A shot that entered our after port on the starboard side of the gun deck killed 2 men at the after Gun and wounded one. From the firing of the first gun to the close of the action was one hour & ten minutes. 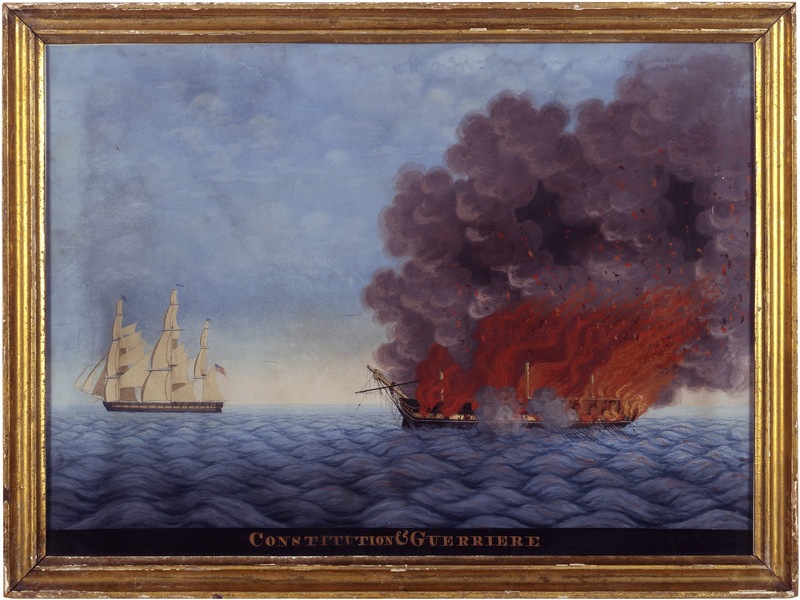 The Guerriere had 15 killd and 62 wounded.” The Americans lost seven killed and seven wounded. At 7:30 the next morning, Lt. George Campbell Read, who had spent an uncomfortable night on Guerriere, hailed to say that the prize had five feet of water in the hold, and that none of the prisoners on board would help to pump the ship. Perhaps they could have plugged the holes, but the real problem was that there were not any spare spars on board with which to rig jury masts. Captain Hull made the difficult decision to scuttle Guerriere. One painter did justice to the scene. The last in a series of paintings of the battle between Constitution and Guerriere by George Ropes, Jr., 1813. USS Constitution Museum Collection. Constitution sailed for Boston and arrived on August 30. News of the victory quickly spread through town, and when Hull set foot on shore on September 1, throngs of cheering Bostonians greeted him, and a militia company escorted him to a reception at the magnificent Exchange Coffee House. More dinners, presentations and awards would follow in the ensuing weeks, months, and years, but nothing could rival the first burst of enthusiasm from a nation hungry for martial glory. The United States Navy intends to commemorate the victory in style. On August 19, 2012, wind and weather conditions permitting, Constitution will stand down Boston Harbor under sail – the first time the shiphas done so since 1997. Fittingly, the ship will hoist her three topsails for the occasion – the same sail configuration that carried her into battle two hundred years ago. For more information about this momentous event, click here.